Putnam survey finds 81% of advisors using social media, and 79% report getting new clients, with average assets gained of $4.6 million. If there’s any question about advisors using social media as a business-building tool, the lastest Putnam Investments survey should dispel that uncertainty. Moreover, it’s not just younger advisors who have embraced the tool, and it’s not just smaller clients who are being reached. Putnam Investments 2015 Social Advisor Study found that 81% of the 817 respondents in the survey said they used social media for business purposes, and 79% said they had gained new clients through social channels. LinkedIn remains the most widely used network — 70% of advisors use it — for prospecting and referral building, Facebook was used by 47% of respondents, and Twitter by 42%. The median amount of assets gathered through social media rose to $1.9 million from $1.2 million in 2014’s survey, but the average was $4.6 million, suggesting that advisors were attracting some large accounts through social. What advisors in general have realized is that they cannot afford not to “keep up with one of the most important relationship-driving tools in the business.” Advisors no longer are wondering ‘How can I fit one more thing into my day,” and social is now beginning to replace advisors’ broader, and often “untargeted” media marketing efforts. He said that “beyond Facebook, LinkedIn and Twitter, we’re seeing a fair number of people using Pinterest, Instagram and even VinedIn,” the Twitter subnetwork for oenophiles. Asked about what he thought were some particularly interesting findings, McKenna said that part of what’s driving advisor social media use is mobile. “LinkedIn and Facebook have dramatically improved” their mobile apps, he said. Then there’s the fact that advisors are becoming “pretty savvy content marketers,” a phenomenon that Putnam itself has experienced. “At Putnam, the biggest click-throughs aren’t to products but to broader-based content,” he reported. Advisors have realized that sharing content on everything from “cycling routes to sailboats” help to show their connections to clients who might share those same interests (thus the VinedIn use). 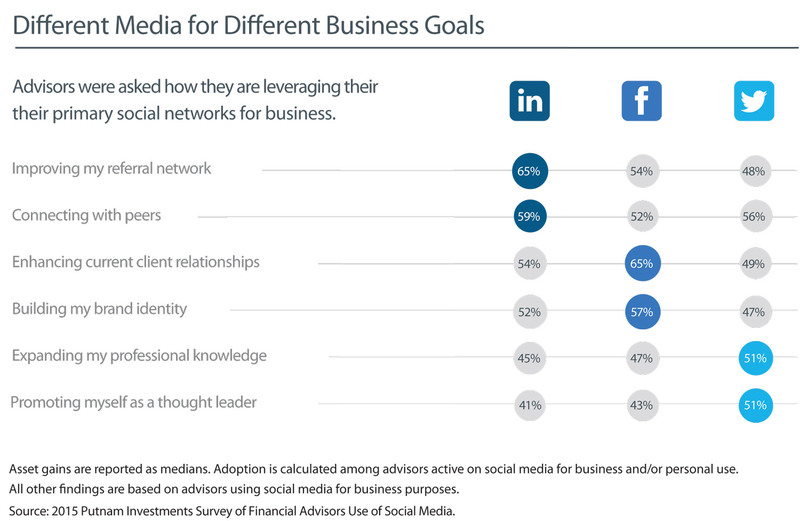 Advisors use certain social platforms to perform different business-building functions: LinkedIn to improve their referral network and connect with other financial professionals; Facebook to enhance client relationships and build professional brand; and Twitter to expand professional knowledge and help establish a thought leadership platform, Putnam reported. In addition, McKenna said that advisors are increasingly getting their business news and information from social sites — equating the sites’ credibility with traditional news sources. The research was conducted nationally online in July by Brightwork Partners among 817 financial advisors — wirehouse brokers, independent BD reps and RIAs — who have been advising retail clients for at least two years.